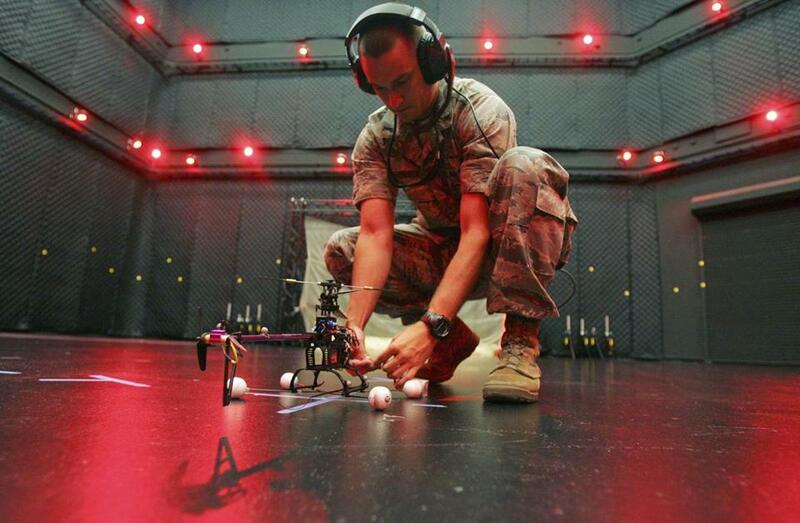 A lieutenant tested a drone at Wright Patterson Air Force Base in Ohio. Air Force General Mark Welsh was among those recently warning budget cuts will harm combat readiness. 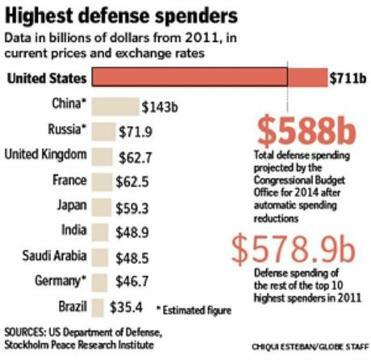 But now that the cuts known as sequestration have been triggered, an unlikely meeting of the minds is taking place among some liberals, libertarians, and Tea Party conservatives: They say the US defense budget, which is larger than that of the next nine largest militaries combined, can and should be cut significantly — and that doing so will not harm national security. That, of course, is not the message coming from the commander in chief, most of the top brass, and members of Congress, many of whom are concerned about job losses or smaller profit margins for defense contractors in their states. 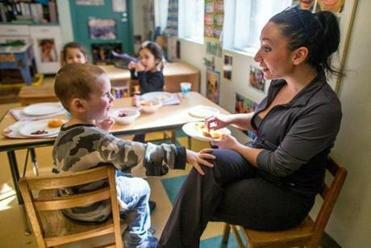 The Head Start program, which serves 2,500 children, is bracing for cuts that could leave 250 children and perhaps a center out in the cold. Read: Where will you notice effects of the budget cuts? In testimony before a House panel, the chiefs of the military branches sounded similar alarms about the combination of the sequester cuts and the failure of Congress so far to pass a complete budget for this year. “We will curtail training for 80 percent of our ground forces,” the Army’s chief of staff, General Raymond Odierno, predicted. “By the beginning of next year, more than 50 percent of my tactical units will be below acceptable levels of readiness for deployment to combat,” added the Marine Corps commandant, General James Amos. The Air Force chief of staff, General Mark Welsh, noted that with reduced training two-thirds of combat units will “drop below acceptable readiness levels, by our definitions, by mid-May. “Most will be completely non-mission-capable as a unit by July,” Welsh said. They all insisted that in addition to the size of the sequestration cuts — nearly $500 billion over the next decade — it is their across-the-board nature that is especially damaging. Tanner also noted that the defense cuts — beginning with $46 billion for the remaining seven months of this fiscal year — will only reduce Pentagon spending to the 2007 levels, when the nation was fighting wars in Iraq and Afghanistan. The cuts are already being incorporated into military planning: one of the nation’s 12 ­Navy aircraft carriers will remain in port instead of joining another on watch in the Persian Gulf; the repair of more than 30,000 pieces of Army equipment will have to wait; and thousands of civilian Pentagon workers have been put on notice they could be furloughed. Yet a recent analysis by the nonpartisan Congressional Research Service indicated that the Pentagon has the flexibility to minimize the negative ­effects. The report concluded, for example, that despite the across-the-board nature of the cuts the Pentagon “would have discretion to allocate funding” to higher priority areas and take steps that “could limit reductions to the services’ readiness-related” programs. Others agreed that the rhetoric from top military officials about the threat to the nation’s combat edge is exaggerated. Last Thursday, it was a group of fiscal conservatives and government watchdog groups saying that. Senator Rand Paul, Republican of Kentucky, said in a Tea Party response to the president’s State of the Union address last month that the sequester cuts should be allowed to take effect, including in the Defense Department. The warnings about the ­ impact of the cuts were also dismissed by a number of budget watchdog groups that participated in a conference call last week about the sequester. Democrats such as US Representative Niki Tsongas of Lowell, who serves on the Armed Services Committee, agreed. She said the sequester formula is not the most effective way to make spending cuts, but also said she believes the US military will maintain its technical edge even if the cuts take effect as scheduled. Those who believe the sequestration cuts will hamper some Pentagon operations agree that Congress could lessen the blow by giving the Department of Defense even more flexibility in applying the cuts. In a statement that many saw as going off the administration’s script, the new secretary of defense, Chuck Hagel, also sought to assure the public in a Friday press conference that the cuts will not make the nation more vulnerable.